The mission and core services of the Division of Subsistence center on scientifically gathering, quantifying, evaluating, and reporting on how Alaskans harvest and use wild resources. Much of the research is conducted in partnerships with local communities and all of the division’s projects follow ethical principles of the social sciences. When a new project is undertaken, division researchers use a range of established scientific methods to fulfill our mission. These methods include systematic and comprehensive household surveys, key respondent interviews, resource mapping, and participant observation. Research results from most studies appear in the division’s Technical Paper and Special Publications Series, which now have over 380 titles. 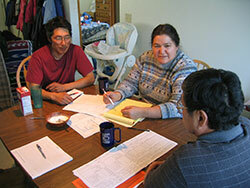 The Community Subsistence Information System (CSIS) online database contains harvest information for over 260 Alaska communities collected by the division from the systematic household surveys. From the links below, you can learn about some of the recent studies conducted by the division in different parts of Alaska.